It seems like a light year since I sat in front of my old apartment window in Hyde Park and typed my last post to let you know I was soon going to be spending the field season in Alaska. While I was gone, Ross emptied out that apartment into boxes and turned his key in its lock for the last time. The boxes now sit in a pod in some dark warehouse—where exactly, I cannot say—waiting for California and yet another first day. It seems like two light years since I put my nose to the curved window of a helicopter that climbed, banked, and turned from a half-dismantled field site that had once been my home entire. The creek where we drew water and which we had crossed dozens of times flashed briefly in the rising—but was the signal land, or go away? From above, the place looked too small to have contained all of our summer’s living. Somehow, oddly, it seems longest of all since I released two of my four-person crew from brief, late hugs, ran through the security area, and crossed the tarmac of Bethel’s tiny airport. I was almost the final seated passenger on the plane that would start my journey back to Chicago, where I am now bound for yet another last day. I say light years because all this feels more like distance than time. As I go along I’ll tell you more—much more, I hope—about this summer’s living, which was sometimes easy and sometimes hard and always good. For the present there is just one small thing I wanted to talk to you about, because it has been on my mind as I have returned to this paved and chattering city. The city is very much alive, and I try to be aware of as much of it as I can. Since I’ve been back I’ve been hearing my favorite kind of crackling in the trees every evening, a very welcome sound (as far as I know there are no singing insects in Alaska). Cooper’s hawks and great blue herons wheel overhead on my early morning runs through the cemetery near the place where I have rented a temporary room. Rabbits buoy over green lawns, and when I walk out to the lake after a day at the museum the air is thick with gulls. In some ways, especially toward the end of the season, the wildlife at our field site (here it is, very approximately, on a map) was actually a little quieter—less teeming—than Chicago’s. What made me feel more present in that world had nothing to do with the abundance of life; it had something to do with using and being used by it. It’s true that much of the wildlife in the city lives intertwined with the artifacts of human existence—true that sitting for lunch on a bench means being besieged by pigeons and squirrels impatient to brawl over your leavings. But what this usually feels like to me is the edges of two kingdoms touching: one human, one other. Both feel vast and systematic, in contact but fundamentally separate. Things were different in the wilderness. There our human kingdom was small, and as light-footed as possible. There is no doubt we were a considerable disruption on the landscape, but the things that lived around us quickly grew used to our presence. And though they didn’t depend on us in the way that most house sparrows depend on urban infrastructure, they did begin to take advantage of us—just as they took advantage of each other. And we took advantage of them, as well. I’ll tell you what I mean. There were two red foxes that made a habit of passing through our campsite of an evening, crossing the water west of our tents to hunt for hare or ptarmigan or vole or to steal an egg or two from a nest. When they did, we would see them using our tracks: those long, trampled-down paths we’d made either this season or in one of the previous two at Allen Creek. For us the trails were unconsciously made. 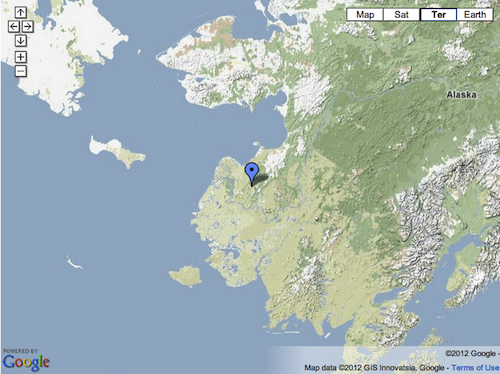 They snaked between various tents, or between camp and the muddy spot on the bank where we dipped buckets into water. For the foxes, they were conveniently flattened walkways over rutted, undulating terrain. 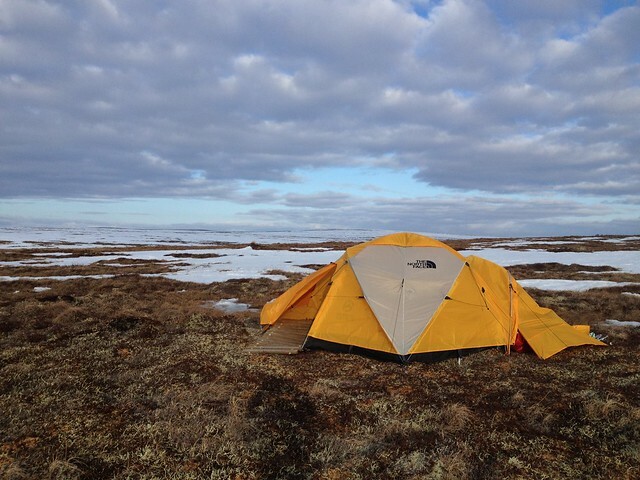 One night I looked up from my journal, half-aware of a whimbrel crying foul behind my tent, and saw a canny hunter trotting directly past my door, catch in his mouth, following a short section of the path Kristine must have made between her tent and the weatherport. Tree swallows—many miles from the nearest grove—nested in our camp. Lacking high branches, they would use our laundry lines and the tops of our tents as convenient places from which to display, calling out in their astonishing liquid voices and stopping at first one nylon roof, then another. They copulated on a great many of our tents and lines, as well. When later they began nesting in earnest, I left a pile of willow ptarmigan feathers I had been collecting next to our storage tent, and one by one they disappeared with a flick of a bill and a wave of a tail. 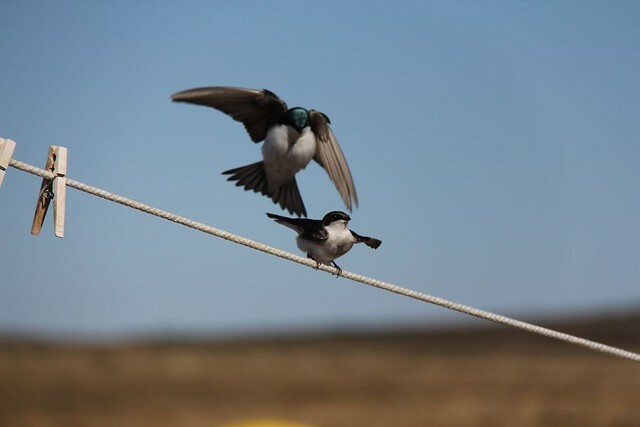 This photo of our swallow pair was taken by Jacob Francis Jung, the kindest, gentlest extremely tall person I know. 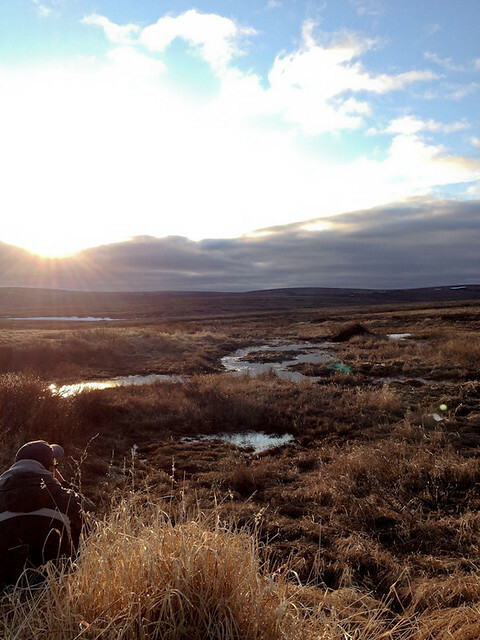 Jake is soon to become a doctor on the basis of his Bristle-thighed curlew research, but he’s also getting some excellent wildlife photography under his belt. The ptarmigan were our closest and dearest of neighbors. One male in particular was always shooting up and barking right in front of the windows through which we looked as we ate and read and planned the day. 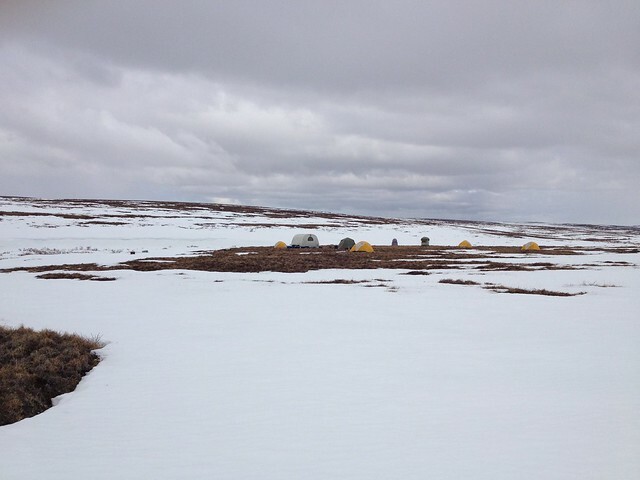 The “Camp Ptarmigan” seemed to grow especially accustomed to us. He once fell asleep not six feet away from me after having greedily eaten his fill of overwintered berries, the red comb above his eye drooping gently in repose as I watched. Once he hopped on top of a snow-covered cooler where we were storing meat and cheese and bread and sat there preening for a long time, as if it were a hummock he’d decided belonged to him. Later a small pile of purple crap remained behind. As for us, if we were careful not to spook anyone, well-trodden moose trails made for wonderfully easy walking through the otherwise dense masses of shrubs that lined either side of the creek or drainages. If we spotted a raven, a short-eared owl, a harrier, or a golden eagle flying low above a curlew territory we were observing, always we would turn an extra-careful eye and ear toward it; the presence of a predator sometimes called up our birds from hidden places on the ground to scold and mob. If we found a long-tailed jaeger nest, we would monitor the area around it very carefully, because this using each other applied in all directions. 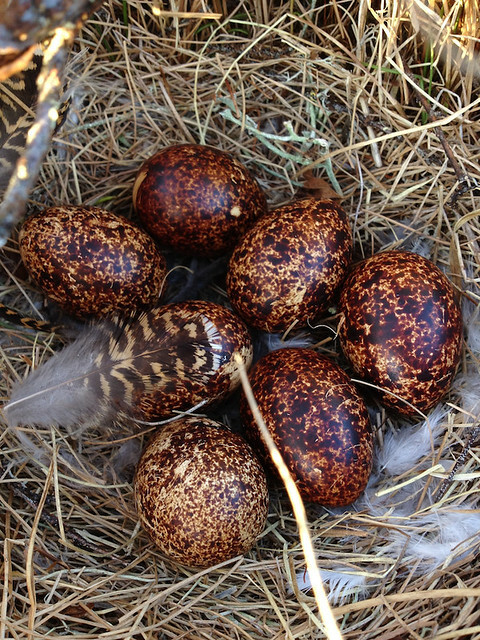 We had reason to believe that curlews, for instance, took advantage of fierce jaeger nest defense behavior to protect their own incubating eggs, as if hiding behind the coattails of a bully. Certainly at least one ptarmigan couple did this: dive-bombed by a pair of screeching jaegers, David flushed a quiet brown female nesting very close by. We checked on the nest later in the season. Unlike many others, it had not been depredated. A whirl of chicks rushed through the grasses. But way, for these glorious tricksters had taken over what was built by one species and become, as water receded, an incredibly safe, hidden, warm, dry hall for housing another. Two brown babies with dense puppy coats tumbled underneath their parent on the beaver mound. So we were happily used. And happily used others. And saw how everyone around us did the same, when they could—when they were not otherwise fleeing from or pursuing each other. It was a single, beautifully selfish world, and this, friends, was one way I knew that we were not just in it but of it. I am laughing right now to say it, but it is true: sweet dreams are made of this. In case you are interested, I am sharing and annotating Alaska photos very slowly, here. While I was gone, the lovely DeLene Beeland (who just became a mother! Hooray!) wrote a review of my book which, as I told her, made me cry. This isn’t hard, as many things make me cry, but nevertheless: it is a great gift to be read with such care. The funny thing—or is it just the ordinary, inevitable thing?—is that I already feel like a different person from the one who wrote Mountainfit. All my thanks to DeLene.